Discussion in 'Australia & New Zealand' started by Chuq, Apr 28, 2017. Interesting, and is the BVIC solar panel and battery storage related do we think? Interesting. I didn't even notice that! I'd say it is unlikely, as power supply to SC sites is covered by Tesla (with rare exceptions, but they are commercial "sponsors", not government). However it could be possible that Tesla are offering some sort of bulk deal. They provide a free solar+battery system and BVIC includes power to the SCs on their meter? Temporary 2-stall site up and running! "The old TAFE car park" is the location given. They removed the sled from Euroa early November, looks like we now know where it ended up. Bathurst now showing as active on the Tesla website. Shows as 'mobile supercharger unit'. 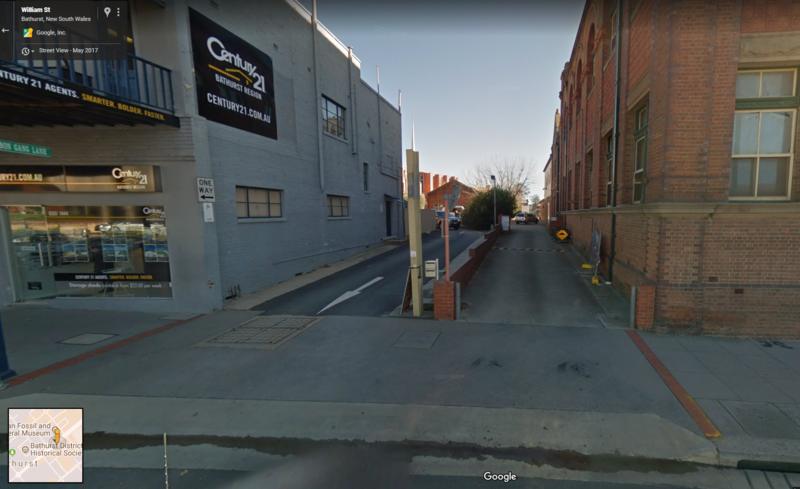 It might confuse people though - from this Google Street View pic, it isn't accessed from Ribbon Gang Lane itself (which is one way and exit only here - accessed from around the corner), but from a driveway next to the lane exit. Hopefully the in-car navigation sorts it out! A relative wants to know if he could drive from Syd to Orange on one charge & return via Bathurst SC. A successful outcome will mean he will buy a Tesla most likely a 100kwhr model. This gentleman has a business in Orange & regularly travels there. Greenrace tells me that any current model Tesla should be fine - the closest is a Model X 75D which would do it with 12% capacity remaining. Worth noting that an S 85D could do the entire return trip with 1% left, so the supercharger is more for peace of mind than anything else. However - this is where some of the differences between petrol and electric come into play. If he owns a business at Orange, why not install an HPWC there? If it is a public facing business (retail/hospitality) why not request to get a couple for free under the Tesla destination charger program? If he is there for 1-2 hours at a time he'll comfortably get enough charge to get back without needing the supercharger at all. I could potentially even do that in my 60 using the supercharger on the return, and certainly if I used it both ways. I will suggest an HPWC both ends. It is a 540k return trip and Orange is 860m ASL. A return trip on one charge with an 85kWhr S should not be possible even on the flat in real world conditions. I do Gundagai SC to Euroa SC (no Wod SC) 380ks from 95% to 8% so from 100% to 0% would yield 420 ks. Conditions solo 50ks luggage110ks no A/C. Absolutely without any question. I have done Sydney-Bathurst return many times and Sydney-Orange a few times in my S85. A 90 or 100D would be even easier. I've done from Hornsby to Bathurst for lunch in an S70 (not D) loaner, charging at the showgrounds with my portable charger. The car used 50% getting there and less coming back because it's downhill. I have friends who live in Cargo - about 40km the other side of Orange. Syd-Orange is no sweat and should only require one charge at Bathurst. Extremely comfortable distance especially with a 100 kW anything. I have driven from Coal Point (Newcastle) to Lithgow which swallows up most of the elevation change and just 20 km less. It did it comfortably and on the way back the downhill sections were as low as 60 wh/km. I was only able to add 25 km on the mobile charger but managed it return in a P90D. I've done this drive myself without the supercharger, using slow charging in Orange, and I have the 75kWh Model S.
Just need to charge at Bathurst on the way out then again on the way back. Probably only about 20 minutes each time. Still no pictures of the Bathurst Supercharger here or on PlugShare. Has anyone used this Supercharger? Am thinking of a trip to Mudgee later this year and was going to go via Bathurst to reduce the amount of charging required in Mudgee. Also do any locals know if the Sofala road from Bathurst through Sofala to Ilford is paved? It will save me 30 Kms but would avoid if not paved. Bathurst to Sofala and Ilford is paved all the way. I'd be curious to see some photos of Bathurst. I was heading that way every few months, but have needed to go since the supercharger opened. Charged here today (Good Friday). Arrived with about 35% SOC. Highest rate I saw was 111KW. It dropped fairly quickly from there. There was another car charging when we returned. And, saw several cars coming into town as we drove out. Suspect they’ll need more than two bays going forward. Bathurst was 95% shut for Good Friday, but there are a couple of nice parks nearby and plenty of cafes, restaurants that would be good bets on a non-holiday. Overall a good setup. I hear there are Superchargers coming to Orange btw. 55 km from Bathurst... unlikely... unless Bathurst Council cannot find a suitable permanent site (which in itself is unlikely since things seem to be reasonably progressed so far - some talk about the Bathurst Visitor Information Centre) and Orange is the replacement. But again, Bathurst is a good strategic location since it covers those travelling south towards Cowra as well. Orange might be pushing it a bit too far from Sydney for some of the lower range models too. Unless - they've had a massive re-think of the entire region, and they're pulling out the Bathurst chargers, and replacing them with three sites at Lithgow, Orange and Cowra. This analysis brought to you by me, and Google Maps. I tried charging in Orange once. I asked the visitor centre if there were any EV chargers (lol, I might as well have been from Mars). I'd be surprised if Orange got a SC so close to Bathurst. Could be the old DC vs SC confusion.